Year-long residency and commission with Siobhan Davies Dance, London. Exhibition of new audio-visual installation at Siobhan Davies Studios, March 17th – April 15th 2018. Inheritors is a new film installation by the artist duo Webb-Ellis created for Siobhan Davies Studios as part of the Traces Commissions programme. Set on the motorways of Britain, Europe and North America, the film takes this ubiquitous landscape as a space from which to question deeply held myths relating to human-beings and evolution. Under the fluorescent light of truck stops, in lay-bys, and on slip-roads, Inheritors situates the human as embedded within the complex processes of communication, interpretation, and meaning-making governing ‘the more-than-human world’. Visions rise up from the roadside, presenting the motorway as a place alive with hidden meaning and associations. The film is shot primarily from within an inhabited coach, which is also the artists’ home and studio. It documents the actions and imaginings of a 13-year-old protagonist, considering the power of adolescent uncertainty and imagination to give rise to new ways of thinking about being human in these difficult times. The artists’ research into posthumanism, paleoanthropology, and biosemiotics finds expression through a story of contemporary and ancient coexistence. Webb-Ellis collaborated with dance artists Charlie Morrissey and Samuel John Kennedy to explore what it means to be ‘in contact’ with other beings and the delicate interfaces between all life. The film’s soundtrack includes a specially-commissioned score by composer Sven Helbig interwoven with a collage of voices including snippets of writing by the poet John Wedgwood Clarke created in response to the artists’ research. John’s full text has been printed for the exhibition and is free to take away. 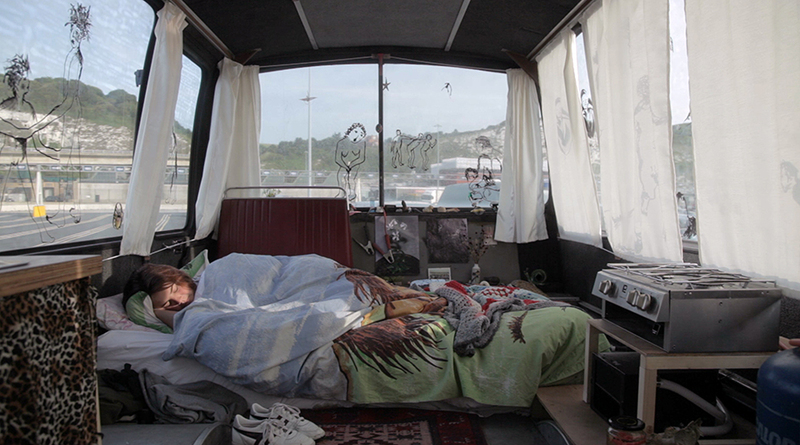 The film is accompanied by scribbled drawings on suspended bus windows, made partly by the unpredictable rocking of the moving vehicle whilst travelling along the motorway. Webb-Ellis developed this project through a series of week-long residencies at Siobhan Davies Studios where they have been in dialogue with Siobhan Davies and programme director Lauren Wright, as well as other artists using the studios. They also participated in week-long programmes of somatically oriented professional dance and movement classes led by teachers with a range of approaches, including Skinner Releasing Technique, Experiential Anatomy, Contact Improvisation, and work with weight and gravity. Webb-Ellis, Inheritors – Exhibition Trailer from Webb-Ellis on Vimeo. Kindly supported by Siobhan Davies Dance, Arts Council England, Canada Council for the Arts and the Beyond Humanism Network.